A big welcome to Carole Bellacera! 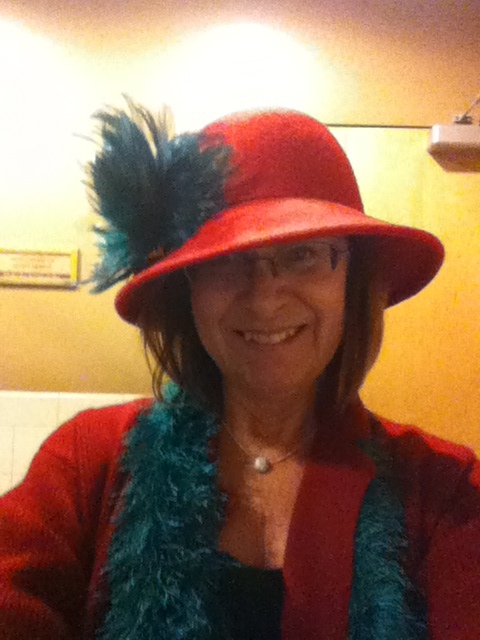 Love the hat and boa, Carole! Tell us when and why did you begin writing? I wrote my first novel in 5th grade, but it didn’t get published. It took me another 25 years to get serious about writing. I went back to college and discovered my love for the written word. It wasn’t until I met Princess Diana in 1985 that inspired an article that became my first published piece. And from that, ambition was born. Women’s fiction…and, in some books, heavy on the romance but not in all of them. Every book is different—and I know publishers/promoters don’t like that, but it’s the way I write. I can never fit into a mold. My first three novels were seat-of-pants, but when it came to book #4, “Understudy”, I wrote a plot outline, and I’ve done that ever since. It helps me stay on track. I adore Anne Rivers Siddons, and wish I could write like her. When I read her books, I drool. And then I give myself a stern talking-to. “Why can’t YOU write like that?” But alas, I am who I am. And in the end, I’m pretty happy with that. Oh, what a tough question. It’s like having to choose between your beloved children. But I guess if pinned down, I’d have to say it’s always my most recent. I guess because I feel the closest to it. So that would be “Lily of the Springs” right now. But when “Cinnamon Girl” comes out (probably this summer) it will be my favorite. I don’t know! My characters talk to me. They come alive as if by magic. So, I try not to question that too much. I just let it happen. Another writer with voices in her head! There seem to be a lot of us. What’s your best/worst experience as a writer? My best experience was getting nominated for a RITA award with my first book, “Border Crossings”. The worst was getting the news from my agent that my book sales were tanking. It felt like my career was over. But like a phoenix, I’ve risen from the ashes. And I’ve learned from that experience not to take it all too seriously. Best- Believe in yourself, and never give up. “Lily of the Springs”, a novel set in 1950’s Kentucky about a young woman who marries the wrong man way too young. And how she develops into an independent, courageous woman after years of trying to make her husband love her. If you want to get lost in a good story that will touch your emotions, I’m the author for you. I love to sing karaoke. And I’ve performed as Marilyn Monroe, Nancy Sinatra and Karen Carpenter in a USO show. I would have loved to see that show! Where can your readers find out more about youyou’re your work? All of my books are available in print and on Kindle. “Border Crossings” and “Lily of the Springs” is also available in audio. Thank you for taking the time to visit with us today, Carole. We look forward to your next release, “Cinnamon Girl”.